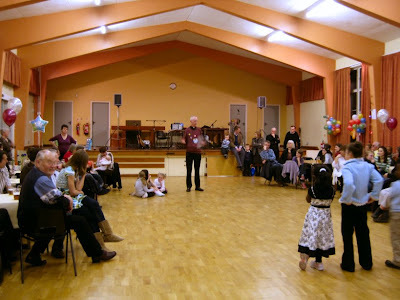 After Mass this evening, I was at a party to celebrate the 50th birthday of Fr John Boyle (South Ashford Priest). 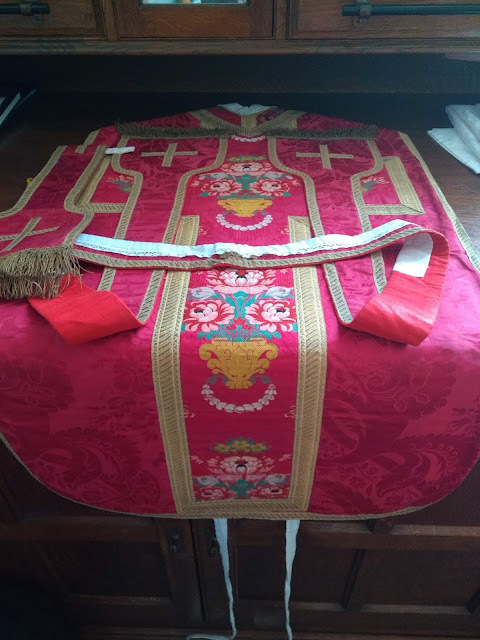 There were one or two other priests there and a few friends from various apostolates but the majority of those present were Fr John's parishioners from St Simon Stock, South Ashford. It was good to see the genuine warmth of feeling that there is between them and their parish priest. After a presentation to him from the parish, Fr John took the opportunity to say a few words about the parish being the family of the priest in addition to his natural family. 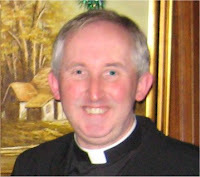 Among the guests was Fr Stephen Boyle, John's brother, who is parish priest at the Good Shepherd in New Addington. Fr Stephen does not have a blog but feels that his lack of labour in this regard is compensated for if he appears on other blogs. Unfortunately, I forgot about this and neglected to take a photo this evening. Nevertheless, there is always something in the archives and so you can see him to the left. There were lots of children present and I guess that some of them thought that a birthday is not complete without a badge saying how old you are. 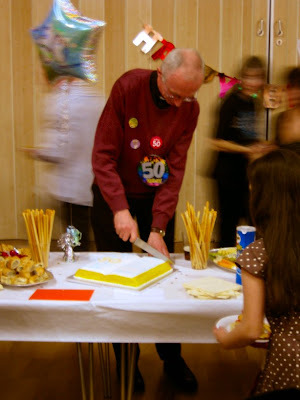 Fr John gallantly wore them as you can see from this photo of him cutting the cake prepared for the occasion. This all reminds me that I am 50 this year on 1 July - a day famous as the beginning of various battles: the Boyne, Gettysburg and the Somme, for example. I share my birthday with Indiana Jones, Pamela Anderson and Princess Diana. It was the day of the death of the wicked emperor Decius and the last of the martyrs of Tyburn, St Oliver Plunkett. In these parts, St Oliver Plunkett is an optional memorial but of course it is likely that I will celebrate Mass that day in the extraordinary form, observing the feast day on which I was born, that of the Precious Blood.